As a person who has a book on the go literally ALL THE TIME (my favorite genres are suspense/mystery/thriller), I encounter many quite good ones and many duds. Once in a while I find a gem. 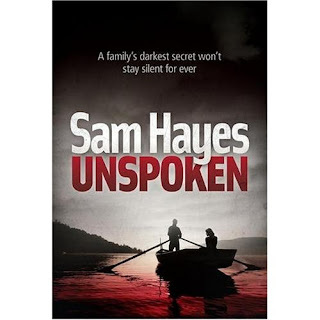 I just finished reading “Unspoken” by Sam Hayes. Wow! It was one of those books that made you neglect everything you were supposed to be doing. I couldn’t put it down until the last page was turned. "Mary Marshall would do anything for her daughter Julia. A devoted grandmother to Julia’s children, she’s always been the rock her family can rely on. Until now. Mary has a past Julia knows nothing about, and it’s come back to haunt her – Murray French is walking a tightrope. A solicitor struggling with an alcohol problem, he’s about to lose his wife Julia and his children to another man: someone successful, someone they deserve. Someone who’s everything he’s not. Can he ever get his family back? Just when Julia Marshall thinks life is starting to turn around, she stumbles upon the brutalised body of a girl she teaches. And as the terrible present starts to shed light on her mother’s past, Julia realises her family’s nightmare is only just beginning…"
How much do we really know about those we love? When a family's dynamic is threatened, how would we react? Written with understanding and emotional acuity, the novel is one I’ll remember for quite some time. For more novels of this genre search the library catalogue under the subject "Psychological thriller".